Knowledge about the design of embedded arithmetic circuits as well as the scientific background of these circuits is the purpose of this course. This will help the students to gain more details about the design of processing units and more practical experience in the implementation of digital systems. The students will increase their experience in the use of hardware description languages to model and implement digital systems. technical skills 30%, method skills 15%, scientific knowledge 30%, social skills 25%. 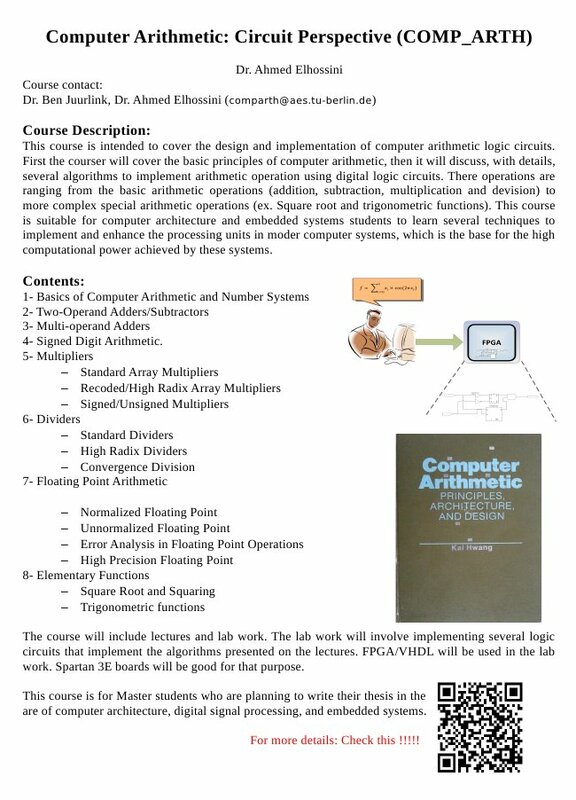 This course is intended to cover the design and implementation of computer arithmetic logic circuits. First the courser will cover the basic principles of computer arithmetic, and then it will discuss, with details, several algorithms to implement arithmetic operation using digital logic circuits. These operations are ranging from the basic arithmetic operations (addition, subtraction, multiplication and division) to more complex special arithmetic operations (ex. Square root and trigonometric functions). This course is suitable for computer architecture and embedded systems students to learn several techniques to implement and enhance the processing units in modern computer systems, which is the base for the high computational power achieved by these systems. Basic knowledge of digital design and digital design process. Basic knowledge of number systems and number representation of digital computers. knowledge of VHDL/FPGA is an advance. Lecture notes will be provided in an electronic form. A text book will be used to provide more details for the students. ISIS2 system will be used to publish all course materials.